Objectives: Through sharing programme knowledge, this poster aims are: 1) to increase knowledge of Implementation Science (IS) research and funding opportunities, particularly late-stage T4 translation research opportunities, including development of country- or region-specific chronic cardiovascular and pulmonary disease research; 2) to emphasise IS and its potential for evidence-based clinical interventions; and, 3) to encourage IS contributions and applications to NIH, including those from low-resource settings. Background: IS strives to increase knowledge about how to understand and accelerate the successful application of evidence-based practices across the spectrum of stakeholders, contexts, health and social issues, in both high- and low-resource settings. IS targeted at reducing the burden of disease associated with chronic obstructive pulmonary disease, ischaemic heart disease, and stroke and related co-morbidities will have significant domestic and global impact. Methods: Research and funding opportunities for IS will be described, including key frameworks and concepts such as efficacy-effectiveness hybrid designs (Curran et al. 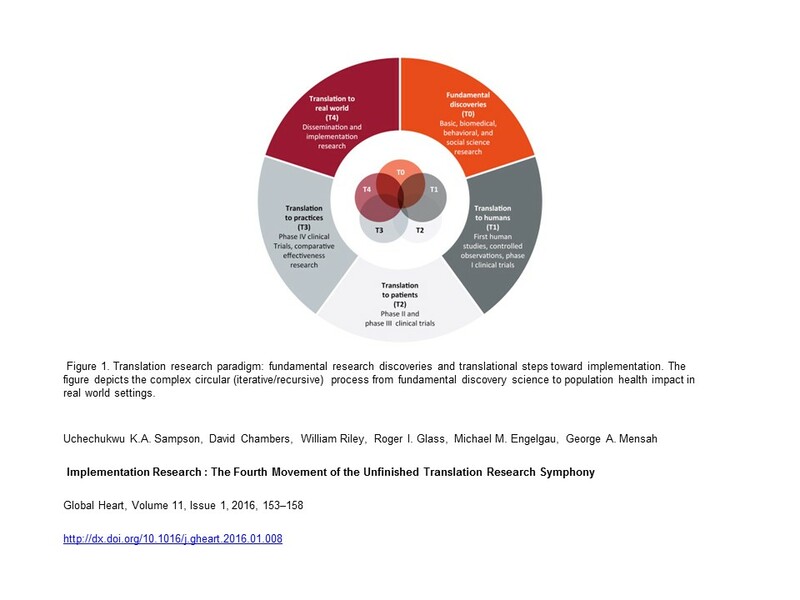 2012) and late-stage T4 translation research (Sampson et al. 2016). Strategies for successful IS research proposals (Pequegnat et al. 2011; Procter et al. 2012), NIH priorities and the strategic vision of the Center for Translation Research for Implementation Science at the National Heart, Lung, and Blood Institute will be highlighted. Results: Shared knowledge on how to use IS within clinical practice and research will be presented. NIH research priorities and specific funding opportunities, particularly for heart, lung, blood and sleep diseases, and co-occurring HIV and other chronic diseases will be highlighted. Conclusion: IS methodologies, applications, and funding opportunities to promote the uptake of research findings exist and are important for reducing the burden of disease, particularly for cardiovascular, lung and other chronic diseases and co-morbidities.